Give your bedroom the styling consideration it deserves and reap the benefits long after. The bedroom is a personal sanctuary, a place that need not please anyone as much as you. Since we spend about a third of each day in repose, it makes sense to ensure our rooms are optimised for the best quality rest possible. And that begins with selecting the correct bedroom furniture. So, when you’ve got the opportunity to redecorate it, make interior choices that ring true to your own tastes so that you can spend time luxuriating in the space. The bed is the centrepiece of the bedroom, so give careful thought to the placement of this. Consider where your windows and doors are situated and how you might feel most comfortable in relation to them. Select a bedstead that is both comfortable and which sets the tone towards the overall look and feel you want to achieve. Tufted material like the Bella Bed offers a whimsical calmness, while translating a luxurious feel. If a bedstead isn’t possible for the type of bed you have, consider adding a headboard for a touch of opulence. This especially helps to set the tone and create a feature out of your bed area. 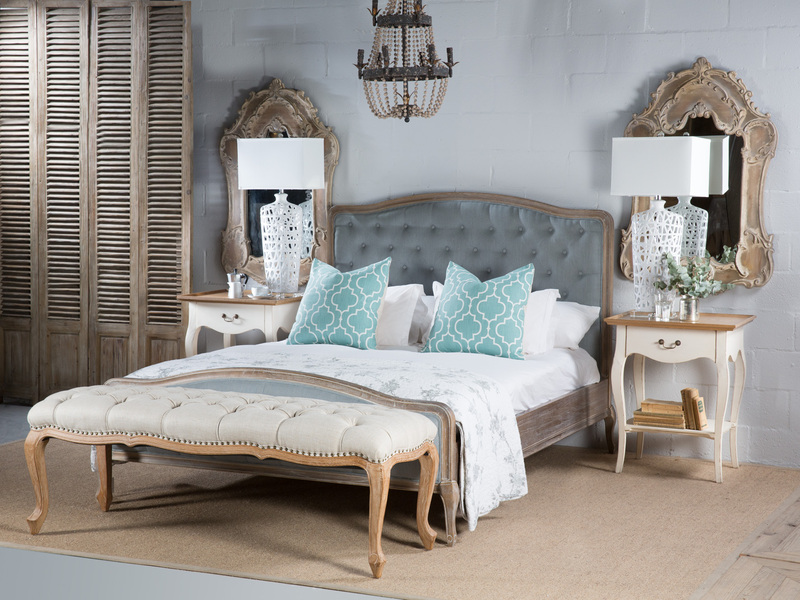 If a tufted look isn’t your style, choose something less ornate, such as the Julia Headboard with a studded trim. Place a rug beneath your bed to pull the room together. You can do this even if your bedroom is carpeted as this will help highlight the bed itself (the main feature of the bedroom), as well as bring up the luxury factor a notch or two. See your rug choice as an opportunity to play around with colour and pattern especially if you've chosen fairly neutral soft furnishings in the rest of the room. Alternatively, opt for a solid colour rug in an interesting material to bring the rest of the patterns and colours together while offering some textural variety. Make sure the rug you choose is large enough to show at least 60cm on either bedside and at the foot of the bed. That means it's important to consider its size in relation to your bed before you place it. If it is deep enough to reach right to the headboard while giving you a generous amount of rug at the foot and sides of the bed, then opt for this placement. For smaller rugs, you can cheat a little by placing it just in front of the side tables. What's important in both instances is that you get a good border of rug around the bed's sides and foot. Keep that as your rule of thumb and you'll be set for rug layout in the bedroom. Once you’ve settled on what you’re placing beneath your bed, it’s time to turn your attention to one of the more practical items on your bedroom décor list: your bedside tables. Keep these simple, and focus on choosing a height that is just higher than your mattress. Opting for a bedside table that is too high will not only be impractical, but will also undo the balance of your bedroom layout. Consider your sleeping habits too when choosing a bedside table. Do you like to keep several items at hand when you go to sleep or are you a minimalist, preferring only an alarm clock, a book and a bedside lamp? Choose a bedside table with storage space if you like a variety of items at your bedside. On the other hand, a bedside table with a single drawer and longer legs can give your bedroom the feeling of more space, so consider this option if you are working with a smaller bedroom. A rule of thumb is to ensure your bedside light is taller than your headboard. When styling your bedside table, give some thought to your bedside lamps. These will offer you functional light at the end of the day, but also give balance to the overall design of the room. Add an Asian element to your room with the Kora Lamp or go for a modern look with the Gigi Lamp. Watch this quick video by InsideOut to learn how to style a bedside table beautifully.